International Journal of Research in Health Sciences,2015,3,1,217-224. 1- Dept of Pathology. 1- Professor & HOD, Santharam Medical college, Nandyal, A.P., INDIA. 2- Associate Professor, Fathima Institute of Medical Sciences, Kadapa, Andhra Pradesh, INDIA. 3- Professor, Santharam Medical college, Nandyal, Andhra Pradesh, INDIA. 4-Associate Professor, Santharam Medical college, Nandyal. 5- Post Graduate, Santharam Medical college, Nandyal, Andhra Pradesh, INDIA. Ovaries are one of the commonest sites of neoplastic lesions and increased frequency of occurrence. The objective of the study was to determine the nature of various primary neoplastic lesions in the ovaries, their frequency and distribution in various age groups, the clinical presentation and to study the various histomorphological patterns of ovarian tumors. A two years prospective study was done to review benign and malignant ovarian neoplasms received in the department of pathology, santhiram medical college and hospital, Nandyal, Kurnool. During this period a total of 140 neoplastic lesions were studied. Most of the tumors were benign (82.85 %), borderline (4.28%) and the malignant tumors were (12.85 %). The first common were, surface epithelial tumors, followed by germ cell tumors. Diagnosis of neoplastic tumors was done by clinical correlation, gross and microscopic features. 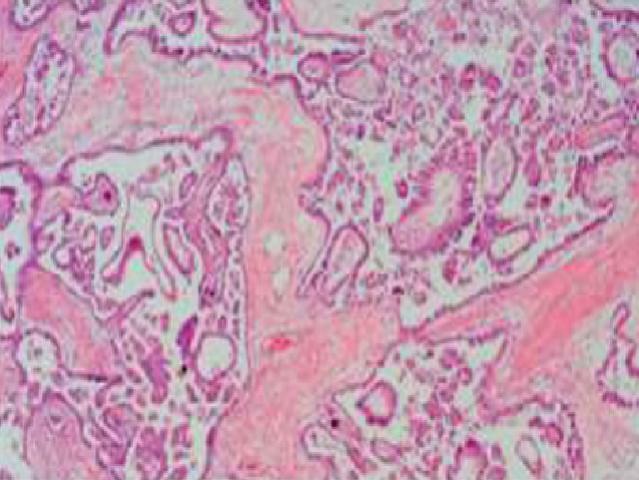 The morphological features of ovarian tumors posses many challenges and requires immunohisto chemistry for final diagnosis.